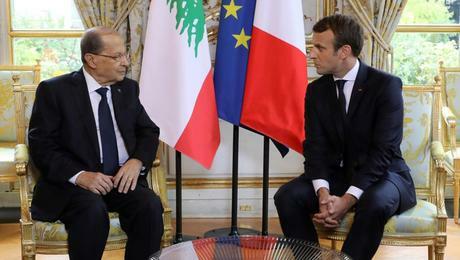 President Michel Aoun said Friday French president Emmanuel Macron, had expressed hope that Lebanon’s government would be formed quickly , but Aoun also stressed to his counterpart that the formation is purely the business of the Lebanese people. “President Macron would definitely like for a government to be formed in Lebanon, especially [because] the parliamentary elections were held,” Aoun said, according to a statement from the presidency. But according to a report by al-Joumhouria daily , Macron , who refrained from making any statement after his meeting with Aoun was “frank and clear” during his meeting with the Lebanese president that Lebanon could lose the $ 12 billion grant allocated at the CEDRE conference if the government formation deadlock persists. The international community is pressuring Paris to reconsider this aid if the government formation is delayed, Macron has reportedly told Aoun. Al-Joumhouri sources said that Macron has refrained from making any statement after meeting Aoun , so that France won’t be accused of meddling in Lebanon’s internal affairs. According to political analysts the real problem in Lebanon is the Iranian backed Hezbollah militant group which has been allied with Aoun since 2006 . “It’s been five months since the election and Lebanon still does not have a government. Hezbollah has enough power to exert pressure on all parties — foes and allies alike — to bring them to form a government within hours if Hezbollah really wants a government in Lebanon ” , one analyst was quoted as saying . Hezbollah profits from the internal squabbles between the sects and feeds them, while maintaining the lofty role of conciliator whenever it suits it, the analyst added in reference to the obstacles created by Aoun ( with Hezbollah’s blessing) on insisting to have a share in the cabinet in addition to the share of FFM , the party that he formed and is now run by his son-in-law caretaker FM Gebran Bassil. The analyst added: Under Aoun, Lebanon is deteriorating as a state and as an Arab country. He is allowing Iran through Hezbollah to confront Lebanon’s cultural and political diversity The project aims at preparing for Iranian control of Lebanon like it did in Iraq and Syria.